Fossil Fuels; Carbon Footprint; Global Warming; Storms; Floods; Droughts; Solutions. Gases such as Carbon Dioxide, Methane and Nitrous oxide – known as Greenhouse gases (GHG) – cause air and ocean temperatures to rise. Over time, warmer temperatures in the atmosphere can change weather patterns and damage the environment. Nitrous oxide is produced through farming and industrial processes. Climate change presents a real and actual challenge for Irish Agriculture. In Ireland, Agriculture accounts for 67.4% of the National land cover. Farming contributes to climate change through the release of GHG’s including Carbon Dioxide, Methane and Nitrous oxide into the atmosphere. Methane is produced by livestock during digestion due to enteric fermentation and is released via belches. 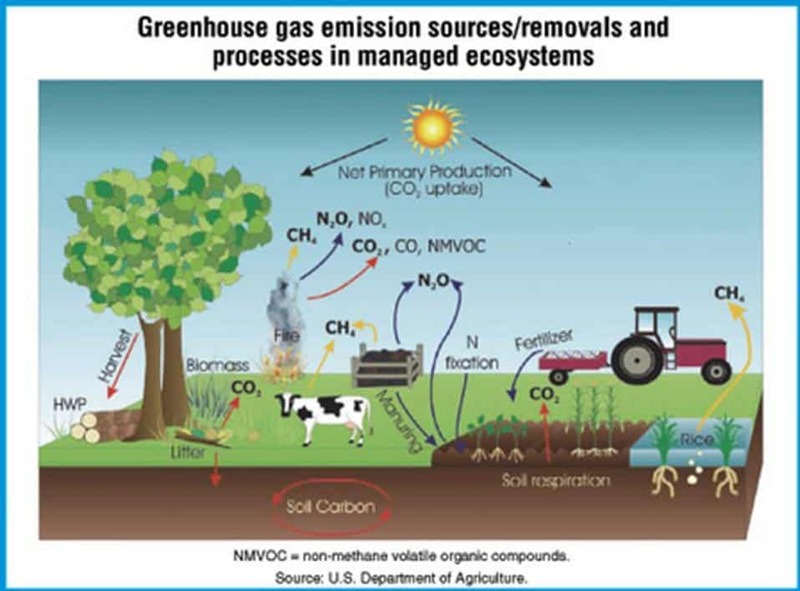 Carbon Dioxide is released through the management of croplands and grassland by ploughing and through the use of fossil fuels in agricultural production. Nitrous oxide is released during soil management practices such as application of fertiliser, or land drainage. How is farming affected by Climate Change? What can farmers do mitigate and adapt to Climate Change? If famers manage their land and animals differently, they can reduce emissions. Farmers must become more sustainable and efficient and use innovative techniques and technologies in production methods to reduce GHG emissions. Increased efficiency will minimise the carbon foot print of the farm making it more sustainable. Mitigation has the potential to reduce climate change impacts, and adaptation can reduce the damage of those impacts. Irish farmers are embracing the challenges and are taking actions to help mitigate and adapt to the possible effects of climate change. Reducing greenhouse gas (GHG) emissions where possible. Farmers will have to adapt to Climate Change by using technological solutions and by adjusting farm management practices. Using genomics to benefit livestock production and improving animal health. The RDP plays a pivotal role in providing funding for resource efficiency in agriculture. Through the provision of funding and grants to address climate change by providing funding to take action in a bid to halt and mitigate the impacts of climate change. Reducing Greenhouse Gas emissions from agriculture. The graph above illustrates each sector contribution from 1990 to 2016 of GHG from across the 28 European Union countries. Ireland is unique to other EU countries as agriculture plays a much larger role in Ireland’s economy which explains the higher level GHG emissions from the agricultural sector vs the rest of Europe. Irish milk, beef and crop production is among the most carbon efficient in the world. The high proportion of GHG emissions from agriculture is both a legacy of our past low industrialisation and our temperate climate and fertile soils which facilitate lush grass growth. When considering Climate Change, we encounter many terms which we do not find in common use in everyday life. These may range from Arable to Vapour. Defining terms is a science in itself and sometimes experts go to great lengths to ensure a very broad and detailed explanation. There are recognised authorities such as the United Nations, the European Union and the EPA in various countries. In the case of Climate Change much work has been done by the European Commission’s “Climate Action”. Arable Land: the word arable in Latin means” land capable of being ploughed’, Arable Land describes a land type within agriculture which is ploughed and planted for the production of crops. Artificial Fertilisers: artificial is something that is man-made or manufactured. Fertiliser is a substance such as animal wastes or a chemical mixture that you can apply to soil to enhance the soil’s nutrient availability to plants. Artificial Fertilisers are manufactured chemical fertilisers which are added to help plants grow more successfully. Atmosphere: the layer of gas that surrounds the earth is called the atmosphere. The earth’s atmosphere is crucial to maintain life on earth. The atmosphere stores a number of atmospheric gasses; Oxygen – vital for human life, Carbon dioxide, Nitrogen, Water Vapour & Methane to name a few. The atmosphere acts like a wrap of insulation around the earth, as the atmospheric gasses absorb and retain heat from the sun, the gasses then keep that heat in the atmosphere helping the earth stay warm. Biodegradable: any material or substance that is capable of been broken down or decomposed by any living organisms or bacteria into its natural materials. Biofuel: can be a liquid gas or solid state, which is derived from naturally occurring organic matter (biomass) such as plants and is used as fuel either directly or indirectly. An example of biofuel crops is wheat, sugar cane and oily seeds. These are also suited to animal feeds. Carbon Dioxide: is a gas made up of chemical compounds carbon and oxygen (CO2). Humans and animals inhale oxygen which is utilised in the body during metabolism and exhale carbon dioxide. Plants inhale and utilise CO2 for growth and exhale oxygen. Excess CO2 present in the earth’s atmosphere is known as a Green House Gas. Carbon Footprint: the measured amount of Carbon which is released to the atmosphere as a direct or indirect result of human activities. For example, when you drive a car fuel is burnt releasing carbon dioxide. Carbon Dioxide is generated during food production or a human activity such as driving a car. As the car is driven it burns fuel creating CO2. The amount of CO2 created depends on the fuel consumption of the car and the distance travelled. Carbon is usually measured in tons of CO2 otherwise known as Carbon Footprint. Carbon Neutral: is a term used to describe an action which creates an amount of CO2 which is equal to the amount of CO2 that is sequestered (absorbed) or offset, which results in zero net carbon emissions. An example of Carbon Neutral in farming is the use of Cover Crops. Cover crops have the ability to sequester CO2 in some cases offsetting the carbon emitted / created from other crops. Carbon Offsetting: otherwise known as Carbon Neutral, is a measure or action implemented which reduces greenhouse gas (GHG) to offset or balance out greenhouse gases (GHG) that have been/will be produced by another activity. For example cutting down a tree and burning releases GHG, planting new trees to replace those cut down will absorb that GHG from the atmosphere, this action is known as Carbon Off setting or Carbon Netural. Carbon Sequestration: this is the process of catching carbon and trapping it for long term storage in carbon sinks (such as soils, forests and the oceans). Humans have been trying to sequester carbon to mitigate or reduce the effects of impending climate change impacts, which are as a result of global warming. Climate: a term used to describe an average of expected weather conditions that have been re-occurring and recorded over a number of years in a particular region or part of the world. Ireland’s climate is known as a ‘Temperate Maritime Climate’ which is influenced greatly by the Atlantic Ocean. Ireland’s climate can be described as a mild humid Climate. Climate Change: climate is a term used to describe an average of expected weather conditions that have been recorded over many years, Climate Change is a shift in previously expected weather conditions which are as a direct result of increased greenhouse gas emissions within the atmosphere. The term Climate Change is used to describe not only global warming but a potential occurrence of irregular extreme weather conditions. Deforestation: forestation is the establishment of forest on land areas. Deforestation is an action whereby trees have been removed or cleared from a previously forested area. Some of the main reasons for deforestation is to create new areas for agriculture or the used of wood for construction or fuel purpose. Failure to sufficiently restore previously forested areas negatively impacts biodiversity and reduces the sequestration potential of area. An estimated 18 million acres (7.3 million hectares) of forest, which is roughly the size of Panama are lost each year according to the United Nations’ Food and Agriculture Organization (FAO). Drought: an extended period of time without any rainfall in a region. Drought in agriculture is best described when soil moisture content is insufficient, which as a result hinders crop growth and production. In parts of the world where drought conditions are common irrigation methods (mechanically applying water to the land) is used to supply sufficient water quantities to help maintain adequate grass and crop growth and production. Emissions: air pollutants produced or released to the atmosphere are known as emissions. It is a widely known fact that globally agriculture is one of the largest GHG emitter, second to the energy sector. Most of the emissions in agriculture are made up of CH4 (methane) which derives from belching cattle & N2O (nitrous oxide) which derives from chemical fertiliser. The 10 countries with the largest agricultural emissions in 2011 were (in descending order): China, Brazil, United States, India, Indonesia, Russian Federation, Democratic Republic of Congo, Argentina, Myanmar, and Pakistan. Together, these countries contributed 51 percent of global agricultural emissions. Flood: an over flow of water on to land that is not usually submerged in water. This usually occurs after heavy rain fall where by water levels of rivers or lakes rise reaching capacity. They then overflow into the surrounding land areas. Floods can damage agricultural crops and can remove top soil from agricultural areas reducing the production capacity or ability nutrient of the area. In Egypt, the river Nile floods on a yearly basis, leaving behind fertile soil on the lands. As a result, the flood plains on the Nile are one of the most fertile land areas in the world. Flora: is a term used to describe all the plant species living in a particular area. There are 2328 species of vascular plants in Ireland, of which 980 are native. (National Biodiversity Data Centre). Fossil Fuel: coal, gas or oil are fossil fuels. Fossil fuel are formed over thousands of years and are used today to heat and power our homes and business. Fossil Fuels are a non-renewable energy resource. When we use or burn fossil fuels we emit greenhouse gasses to the atmosphere adding to air pollution and global warming. Global Warming: global Warming is a term used to describe a gradual rise in overall global temperature, due to increased emissions of GHG’s to the earth’s atmosphere. These GHG’s linger in the atmosphere, trapping heat from the sun and raise global atmospheric temperatures. CO2 lasts in the earth’s atmosphere for up to 200 years (depending on carbon capture/ sequestration levels). Methane can last in the earth’s atmosphere for up to 12 years. Nitrous oxide can last in the earth’s atmosphere for up to 114 years and compounds such as chlorine and/or fluorine such as CFC’s can last in the atmosphere from 1 year to over 1000 years. Greenhouse Gas: any gas present or released into the atmosphere that absorbs solar radiation / heat from the sun is known as a greenhouse gas. Carbon Dioxide (CO2) and Methane (CH4) and Water Vapour are examples of the main Greenhouse gases in our atmosphere. Kyoto Protocol: is an International Treaty which followed 1992’s United Nations Framework Convention of Climate Change (UNFCC), which laid out with the mutual agreement amongst its member states that global warming exists and that it was caused by man-made CO2 emissions. The international treaty commits that member states will reduce their Greenhouse gas emissions. Land Erosion: is a re-occurring process which effects all land forms. In agriculture land erosion describes the process by which material on the surface of the land becomes dislodged and moves. Land erosion is a contributor to a reduction in water quality. When the sediment from the land gets washed into our rivers or streams due to high levels of rain fall, the sediments (enriched) nutrients becomes a pollutant in streams and rivers. Agriculture can combat land erosion by planting trees and vegetation as ground cover to bind the soil. Plants play a huge part in prevention of land erosion. Plant cover protects the soil from exposure to wind and rain, while plants root structure knits the soil securely together, meaning soil is less likely to move. Methane: this gas is comprised of Carbon and 4 Hydrogen atoms (CH4). In relation to agriculture, Methane emissions primarily results from livestock. Agriculture accounts for the majority of methane (CH4) emissions in Ireland (85%) due to the dominance of cattle and sheep livestock production in Irish agricultural output. Ruminant animals release CH4 as a bi-product of microbial fermentation of food in the rumen and large intestine (digestion). Mitigation: measures put in place to soften or reduce the severity of impact that cannot be avoided completely. In terms of Climate Change, Mitigation is often a phrase used to reduce GHG emissions. This action in turn will slow down or make Climate Change impacts less severe. One action commonly practiced by Irish farmers is Low-emission slurry spreading. This practice reduces the amount of nitrous oxide that could be lost to the atmosphere when spreading organic manures versus the use of a splash plate. Native Species: is a term used to describe flora and fauna that were present in a particular country or area prior to the arrival of humans. Some common native tree species in Ireland are Ash, Birch and Oak. Non-Biodegradable: is anything, material or substance that is not capable of been broken down or decomposed in or by the environment. Non-biodegradable substances are harmful and cause pollution to the environment when burned. Non-biodegradable items can be useful if recycled. Examples of non-Biodegradable materials are Plastics, Glasses, Metals, Toxic chemicals, plastic containers, and plastic grocery bags. Non-Native Species: is a term to describe flora and fauna that have been introduced to an area in which they previously did not exist. Non- Native species may have been introduced deliberately or accidently by humans. Some common non-native tree species in Ireland are Beech, Sycamore and Horse Chestnut. Organic Fertilisers: organic is a term used to describe food or meat grown or raised without the addition of chemicals or pesticides. Fertilisers that derive from rotting organic materials such as compost or animal manure are considered as organic manures. 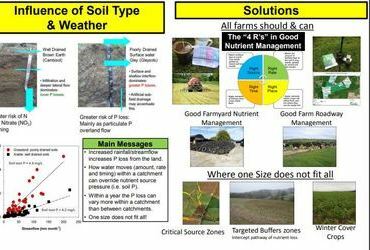 Examples of Organic Fertilisers; Animal excreta- manures, plant waste – composting & green manure otherwise known as crop residues (stubble left in the field after harvest). Renewable Energy: energy that is created and replaced rapidly from re-occurring natural resources such as wind, water or solar energy. This renewable energy could play a key role in mitigating the effects of climate change. If utilised widely across the world, the need for the use or reliance on fossil fuels would then be reduced in turn reducing greenhouse gas emissions. Slurry: describes the accumulation of livestock manures and faeces which is collected and stored on farm over the winter months in a storage unit. Slurry is spread on the land as organic fertiliser to increase the lands soil fertility which in turn increases crop yields. Slurry is in a semi liquid form and is often measured in gallons or m3. Slurry contains the nutrients Nitrogen (N), Phosphorus (P) and Potassium (K). 1000 gallons of slurry has a nutritive value content similar to a 50kg bag of chemical fertiliser 6-5-30 (units of N, P & K respectively). 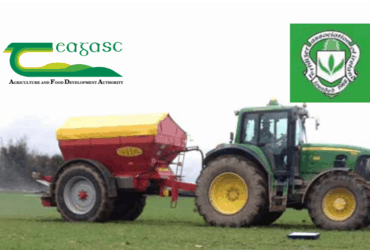 Slurry is best applied in spring as weather conditions are most suitable prevent the Nitrogen been lost to the atmosphere.